Receptionists at the doctors’ surgery aren’t everyone’s cup of tea – but they certainly have their moments. These ‘doormen’ of the NHS quite often find themselves at the front line of managing angry patients who are battling to get an appointment to see overworked and understaffed GPs. However, one such soul deserves the highest praise this week with the manner in which she dealt with a patient who decided to bring their own dose of casual prejudice to the surgery. Glasgow GP Dr Punam Krishan revealed on Twitter how the patient in question had told the receptionist they did not want to see an "Asian doctor". The patient was informed that Dr Krishan was Scottish, only to be told: "She doesn't look Scottish." 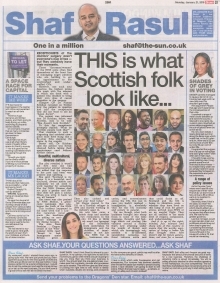 To this the receptionist promptly replied: "What do Scottish people look like?" That response to such a disgusting and outdated viewpoint must have stung like a fly-away fitba slapping the orator in the coupon. Better still, Dr Krishan said the patient was firmly silenced before taking their appointment card without further debate. Unfortunately she also revealed it wasn't the first time she had encountered similar attitudes. But added the response to her post had been very positive and uplifting. She said: "Scotland is my home. It is a beautiful, multicultural, diverse nation and ultimately we all need to work together for something like the NHS. Disease does not pick a gender and disease does not pick a colour. When you strip it back we are all human." Her tweet was also praised by NHS Million, a grassroots campaign that celebrates the work of the NHS. This incident happened in the same week that a London restaurant owner made the headlines for adding an anti-Brexit message to his dining receipts. Mr Dogus moved to the UK as a Kurdish refugee in 1994 and started working in the industry aged 14. He now also owns a kebab shop and another two restaurants in the city. I’d like to think we aren’t too ignorant of the incredible work undertaken by immigrants and the children of immigrants in not just the NHS but in businesses, education, and entertainment across the UK. But just in case you hadn’t realised – immigration is absolutely vital for the UK economy and society in general. For me though, what both incidents brought into sharp focus is some of the toxic messages, thoughts and feelings which are circling like vultures around a society that’s now straining under the weight of Brexit and to my mind increasingly vulnerable to ill-informed, xenophobic nonsense. Let those vultures settle and they could just about finish us off. Scotland and the UK is home to some 66 million souls – whether they have lived on this lump of rock for generations, arrived post-WW2 or on an easyJet flight – they are all entitled to the same level of respect, compassion, and understanding. And it is up to the right-minded, fair, tolerant and sharp wits of this country to ensure that the worthy aspiration of living a better life that brought them here doesn’t slip for future generations, not even for a second. Singer Jamelia managed to cause a fair bit of controversy last week with her view that over-75s shouldn’t get a vote. Her argument? People that age won’t experience the consequences of their vote. It sparked a range of water cooler debates up and down the country. I listened to one radio discussion open-mouthed as some callers suggested the cut-off should even be as low as 60. It’s not a new debate. I read a blog last summer along the same lines which noted that, in the EU referendum, there was a 90 per cent turnout of over 65s but only 64 per cent of under 25s. It supported the suggestion of a cap on voting age and said ‘grey voters’ were often set in their ways. I thought it was a somewhat insulting view. It suggested some kind of irrational stubbornness – but maybe many older voters simply hold firm views because they’re based on life experience and political awareness. As for the view ‘grey’ voters won’t see the consequences of their vote? First of all, we don’t know if folk will live to 55 or 95 so we’re in no position to make that call. Secondly, even if that is the case, so what? We don’t just vote for things which directly affect us – we vote on a range of policy issues that affect everyone. We vote for the greater good too. Last but not least, would an age cap also mean our politicians should bow out when they’re grey too? Considering the average age in the House of Commons is 50 and in House of Lords is 70, that would be interesting. It’s bad news for businesses in the capital, with office rent expected to reach an all time high. There’s high demand, and limited supply, and that’s going to keep driving up costs according to property advisor Savills. On one hand it’s great that so many companies are keen to base themselves in Edinburgh. But that’s not much use when there’s a lack of quality office space for them to occupy – nor is it good for the existing businesses who’ll be paying though the nose. Think about the attributes that make people successful – what springs to mind? Brains? Tenacity? A can-do attitude? WRONG. Apparently being an Aquarius does the trick. So says the Journal of Social Sciences after conducting a study of 300 people from various walks of life, from politicians and sports icons to Hollywood stars. Call me a cynic but I’m not entirely convinced those born under different star signs need to be too worried about this research. The real secret to success is good, hard graft, the ability to learn from your mistakes, and buckets of determination.